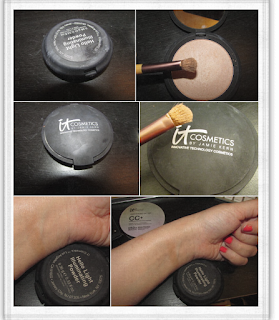 I am back again with another blog on one of my Favorite Brands, It cosmetics. I can honestly say of all of the makeup brands I use, I tend to use It cosmetics, Mac and Toofaced a lot more, the last couple of months. It cosmetics is really becoming one of my holy grail makeup brands. I love how smooth and beautiful the makeup products work on the skin. My favorite, It cosmetics products, are the skin products, because not only do they work, last for a long time but they also improve your skin. They give you the feeling of luxury without the several cost of luxury. You can find deals on Ulta or QVC on it cosmetics usually all the time, if you just look. Now I will say this brand is not drugstore price but for the higher end, it is quite affordable and so worth the value. I would call It Cosmetics, the middle class of cosmetic brands, and isn't our beautiful country built by the middle class.. These products help improved the skin, they feel like silk on the skin and they blend so well. They are amazing to use during anytime of the year, I especially love it cosmetics in the summer time when I sweat like a rainy day. They have vitamins galore for the skin, that help improve the skin texture but don't make you feel like you have cake on makeup products. It cosmetics are just a heavenly brand to me, which means they feel like heaven when I am wear them. Now I am going to get to the items I am talking about in this blog, lets go It Cosmetic lovers.. Gives you the look and feel of your softest skin in 30 seconds. Made with skin-loving Drops of Light Technology®, this multi-tasking powder is formulated to transform the look of your skin with a veil of optical-blurring pigments that visually camouflage pores, dark spots and fine lines, while instantly leaving your skin porcelain soft, flawless and luminous. It's your one-of-a-kind UVA/UVB broad spectrum physical-only SPF 50+, and talc-free formula. Developed with lightweight pigments that never settle into wrinkles or pores. A blend of anti-aging ingredients pamper and restore your complexion, giving you added skin care benefits and real results. Infused with skin-loving ingredients, including hydrolyzed silk, hydrolyzed collagen, niacin and peptides. Lightweight, hydrating powder formulated to even your skin tone and banish the look of pores without settling into your fine lines and wrinkles. Talc-free powder is infused with Hydrolyzed Silk, Hydrolyzed Collagen, Niacin, Peptides, and other anti-aging ingredients! Over makeup or over clean skin, this is how you get even, soft-looking, airbrushed perfection." This product also has Broad Spectrum SPF which is what you want in a product, because it helps better protect your skin from Skin Cancer. It also comes in shade ranges of Fair, which is the lightest and palest, then Light which is light with a hint of color too it, then medium which is for light to tan people then comes tan which is for tan to dark skin and then finally Rich which is for the darker skin ladies. That is an amazing tone range for It cosmetics which is usually Fair, Light, Medium and Tan in their tone range. This product is only 35.00 dollars at Ulta and It cosmetics. Right now it is not available on QVC. Now, I will say again, yes 35.00 dollars is a lot of money for one product, but this item lasts for six to seven months, using it everyday. It is also very healthy for the skin like all it cosmetics products. Also Ulta has a habit of having coupons or deals left and right plus their is always Ebates which helps gain a percentage back when shopping online, so you ready would not be losing your value when buying this product. So go check it out and once again, I will have all purchase links list below in the blog plus my contact information. So give this product, a try and you will never look back, I assure you. Now onto the celebration foundation by It cosmetics. First I want to say there is two of types of the celebration foundation, The first type of above is in the black case. The black Case celebration foundation is made for oily skin girls because its more matte. The there is the white case celebration foundation which gives you more of glowly, dewy look to your skin. I can't speak for the white case foundation because I have yet to own it. Notice, how I said ::YET:: lol, its because I love this brand the products they produce for women. I wish I could roll my whole body around in, it cosmetics products. Btw I just bought, It cosmetics Press setting powder in the compact from their website, because I fell in love with it. So now back to the Black Compact Celebration Foundation. 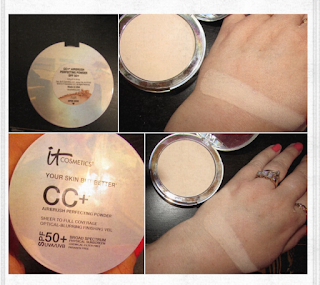 Just like the CC powder above, this product also glides on smoothy, is easy to apply and gives you a full coverage look without looking cakey.. I don't think any It cosmetics powder, I own looks cakey when I apply it. This foundation leaves what I would call a semi matte look because it is matte but doesn't make your face flat looking. It gives you depth when using it but keeps the shine away from oil. I love this on those days, I have no time and have to be out the door early. It feels like cream on the face but its powder, it has the feeling of baby bottom on your face, lol.. I also want to add, that this foundation claims to be anti- aging product which is always good for the skin. It also come in five different range tones for the skin. Like I told you with the CC powder above this product comes with Fair for pale skin, Light for Light to slightly tan skin, then Meduim for light tan to tan skin, tan is for Tan to lightly dark skin and then finally rich which is for the beautiful dark skin ladies out there. "What is it: Rich in peptides, hydrolyzed collagen, and antiaging technology, Celebration Foundation is a full-coverage, antiaging foundation that gives you the power to achieve flawless, airbrushed complexion perfection! It delivers highly pigmented coverage that will never crease or crack and is designed not only to cover, but also to make skin appear younger. The antiaging technology gives you an airbrushed finish that looks and feels like silk. It absorbs oil and shine without settling into lines and wrinkles. The Heavenly Luxe Buffing Airbrush Foundation Brush is the most ultra-luxe, ultra-plush tool for perfect airbrushed application. Why is it different: Using antiaging ingredients--including hydrolyzed collagen, peptides, antioxidants, grape seed oil, olive oil, hyaluronic acid, rose, aloe, niacin, silk, and vitamins A, C, and E--this foundation helps treat skin with antiaging benefits and give more youthful radiance while completely concealing imperfections and blurring away the look of pores, fine lines, and wrinkles. 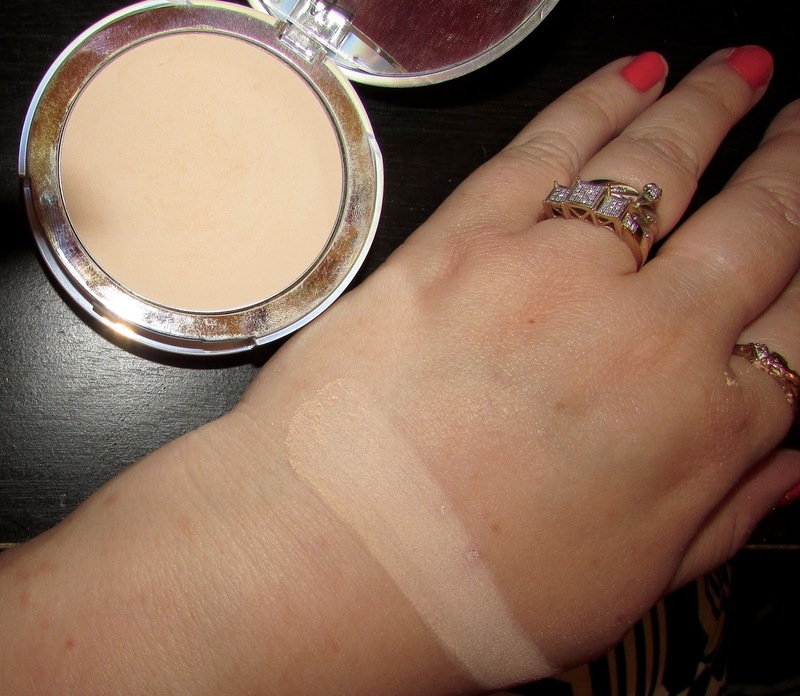 The creamy, crease-proof powder foundation glides on easily and lasts. It's formulated without talc, parabens, sodium lauryl sulfate, mineral oil, petrolatum, synthetic fragrance, and phthalates. As Always all product links will be list below and this product by itself is normally 35.00 dollars but on QVC is comes with a IT cosmetics brush for 44.00 dollars which is an amazing deal because it cosmetics brushes can be very expensive by themselves. Any time you can get a deal on QVC with an it cosmetic product and brush, I would take it because they are totally worth the value together. It cosmetic brushes are heaven all by themselves but then combine with the product, its like the heaven doors open and Angels are singing. So go check the deals out when it comes to It cosmetic items. This powder is an Illuminizer which means it is use to highlight your makeup or make your skin look Glowingly without all the shine. When you highlight, they now call it strobing oddly enough. 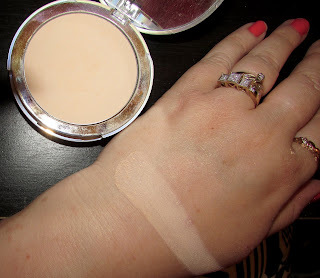 But the great thing about this product, that I love is that it has a soft tone to it when applied. It also comes with all of the normal healthy It cosmetics claims, which isn't the best way to say that but is totally the truth. All it cosmetics items have healthy skin benefits. So when your applying these products, you don't have to worry about skin irritation or break outs with your sensitive skin. i have super sensitive skin and I can wear every it cosmetic product except the original Mascara. When I say health benefits, I mean it because these products improve your skin and make it feel smooth and beautiful. Now back to the Highlighter, I love using this to set under my eyes along with highlighting my cheek bones and above my brows. I usually draw a heart on my face when using this highlighter because its soft enough in tone, to give you that light reflective look but doesn't go to the point of looking like your wearing a glitter ball on your face. The reason I use it underneath my eyes, is because it brightens the area but deflects the dark tone under neath my eyes. I just love it cosmetics products and this is one of my favorite products from them when it comes to the face. "What is it: An antiaging powerhouse for naturally pretty, lit-from-within skin. 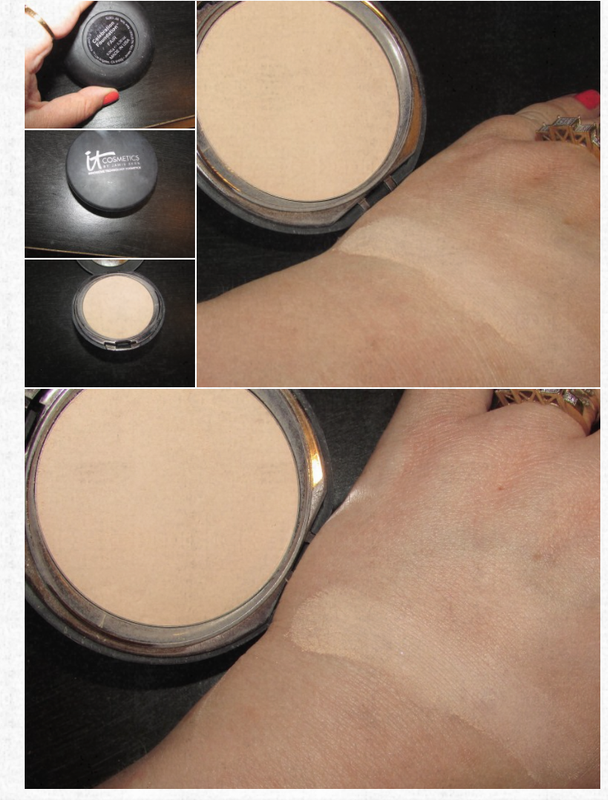 IT Cosmetics Hello Light Anti-Aging Luminizing Powder is all about the look of vitality, radiance, and illumination. The formula is infused with micronized pigments of light. Peptides, hyaluronic acid, hydrolyzed collagen, silk, and vitamins A, C, and E pamper your skin! Who is it for: Anyone who wants natural-looking radiance and a youthful, vitality-filled glow, and wants to achieve a more radiant, airbrushed-looking complexion. Why is it different: This truly innovative formula nourishes skin, absorbs oil and shine, and blurs away the look of pores without settling into lines and wrinkles. How do I use it: Using the IT Cosmetics Heavenly Luxe Angled Radiance Brush (not included), follow the face chart on the back of the box to lightly dust over the areas of your face you wish to illuminate or bring forward. Use on bare skin or over foundation. All items will have all website links below. This highlight is 24.00 dollars and so worth the price. It is a little more pricey then some high lights but You have to consider, that it is softer tone highlight so you can wear it everyday. It also has vitamins for anti aging benefits in it, to help soften your skin as you age and what i mean by that is that your skin won't look so mature as you age but will be softer, smoother and more youthful looking. I am only 30 and I already know that products like this will help my genetics continue to look young or should I say younger because my genetics alone already produce good young genetic looks. So thanks again for reading another blog by me, I hope it was informative and helpful when it comes to buying it cosmetics products. I also hope you do give this brand a try because I love it and swear by this brand. I have no affiliation with IT cosmetics in any shape or form, I wish I did but I don't. I bought all of these products myself and this blog is my opinion alone. I want more of this brand as we speak and I will continue to buy from them to build my collection up because thats how much I enjoy this brand. This blog has tempted me and now it seems that I must visit all the time this web page.